Off to a great stop? So I merged my two blogs back in May, in hopes that I would feel less intimidated and overwhelmed by the concept of updating two blogs regularly and that I would be able to get back to blogging here on a regular basis. But another thing that happened was last summer. I had a lot of stuff going on and I just lost that urge to blog all the time. Frankly, I got tired of it. And for the past year, off and on, I have been toying with a name change, a change of focus, and many other changes for this blog in hopes that it would inspire me to get back here and write some great posts again. Well, nothing has been nailed down as you can see. But I have been reading other blogs regularly again and I am inspired to see so many that are not limiting themselves with a certain “topic.” I always thought since this was called See Sarah Eat and I established it as a food blog that it had to stay that way forever. Luckily, I have gotten over that (even letting a certain food-driven ad provider go) and I do now feel like I can talk about anything pertaining to my life or my experiences and not “worry” about whether or not it fits in here. This is my blog! I can write whatever I want! I am changing, life is changing, so it’s only natural that my blog should follow me. Not to say I will never write about food or weight loss again, I will, just not all the time. I actually do have a couple of recipes to share. But there’s also so much more to life that I want to discuss. Why do I always put so much pressure on myself? I’m so silly. Anyway, that’s just an update. Hopefully it won’t be another month before I come back here. In the mean time, here is a picture of me with Louisville’s own Morel’s Food Truck, which I finally visited at Abbey Road on the River, a Beatles festival that was here in Louisville over Memorial Day weekend. The guy who runs it is actually a dude I went to high school with. Pretty cool, huh? Thank you all so much for the support on yesterday’s post: Blogging in 2011. That just shows me how much I need to be here “talking” to you all! However, there will be times when life is about more than food, such as setting goals for the new year. In addition to my desire to cook more in 2011, I have three other goals and I must make each one a priority this coming year (and beyond). Blogging. I love to write and I have missed it terribly these past few months. I finally feel like I’m finally ready to make it a priority again but I’m not going to put pressure on myself like before. That’s just a means to an end! So I look forward to writing more here and over at River City Fitness in the coming year. Reading. I think I read one book last year. One. I started a few others but then I came down with some form of ADD, so I would sit it aside and never go back to it. Maybe I’ve just been so distracted by life, the internet, etc. that I haven’t sat down to read a book in months. Either way, this must change! I have so many things I want to read, plus I would like to get back into a regular “routine” of reading the Bible as well. As for books, I hope to read 2 per month. One non-fiction and one novel. So that’s it for me! What are your goals for 2011? I’m also sure you’ve noticed I have not been blogging much lately. Things got kind of crazy over the summer and I just reached a point where maintaining a “normal” blogging schedule just wasn’t possible for me, mentally. While I have done a few posts here and there, I had started to wonder if I even wanted to do this anymore and if so, why? Thankfully, I do want to come back but things are going to change. As I stated in my “blog evolution” post back in October, I don’t want to talk about my weight as much anymore. I lost 70 lbs in 2007 and have been able to maintain most of that. I know the journey is different for everyone but for me, maintenance has been harder than the initial loss. I go up 10 lbs or so every year and then get it back down eventually. So while I am working toward keeping my weight “regular” and maybe even losing a bit more, I don’t feel the need to discuss that here. Also, like many fellow food bloggers have stated recently, the “food journal” type of posting is just not working for me. It is a chore to write those type of posts and that is not how it should be. Also, taking pictures of Clif bar wrappers over and over again is just not my idea of fun these days! I also have to admit that I don’t like reading these super long, wordy (or picture heavy) posts much either (unless I love you, and you know who you are, ha ha). What I do want to share are my cooking experiences. Losing weight and gradually evolving my diet helped me see food in a new way and cooking has become fun for me. I am NOT a chef and not even that great of a cook but I can follow a recipe like no one’s business. I just need practice and more experimenting with new methods and ingredients in order to improve. I’m hoping the blog (and another opportunity I’ve been given recently) will inspire me to keep at it! I also want to keep reviewing Louisville restaurants (or others I visit out of town) and post product reviews when I try something new. I may occasionally talk about veganism too as I learn more and experience new things in that area of my life. I’m not sure how often I will be posting but most likely just when I get inspired or have the time to report on a new recipe I tried, or a new restaurant or product. Hopefully I will be posting at least once a week, but we will just have to wait and see. I have to admit, this thing has been in my freezer for quite some time. 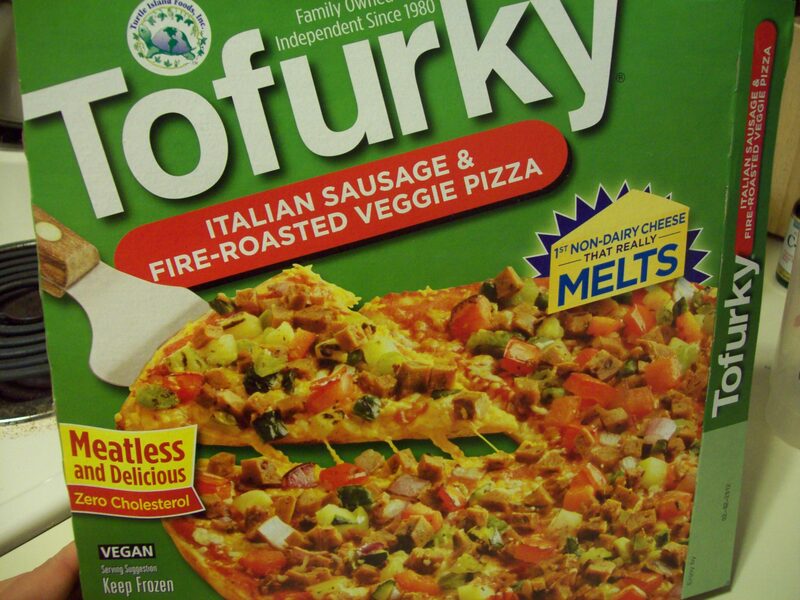 I was really excited when I heard that the vegan Tofurky Pizza finally came out and were being carried at my local Whole Foods Market. 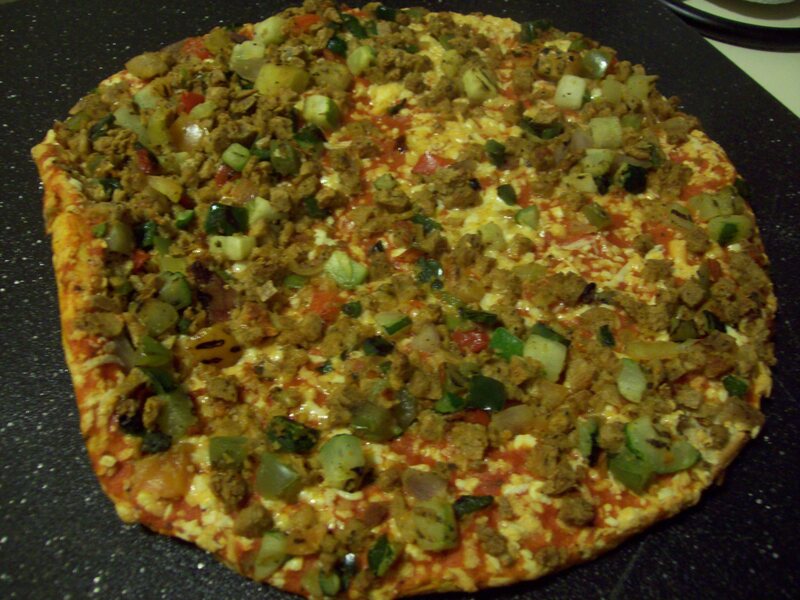 The best selling point for this pizza is the Daiya cheese, which is the best vegan cheese (for pizza) on the market, in my opinion. I tried it on a homemade pizza once and it was delicious. I didn’t care much for the high price of this item (around $7) but you have to factor convenience into the cost. This would feed me for at least two meals and only took 12 minutes to cook in the oven. No time spent on preparation or chopping veggies for toppings. I decided to get the Italian “Sausage” and Fire Roasted Veggie because a plain cheese pizza just sounded boring to me and the only other choice was pepperoni. I need my veggies! Plus, this may be the only time I try this product so I had to go all out! The left side got bent a little bit from being shoved around in my freezer for several weeks. But other than that slight defect, this looked pretty good! I liked that the crust was thin and got a little crispy thanks to my cooking it directly on the oven rack. 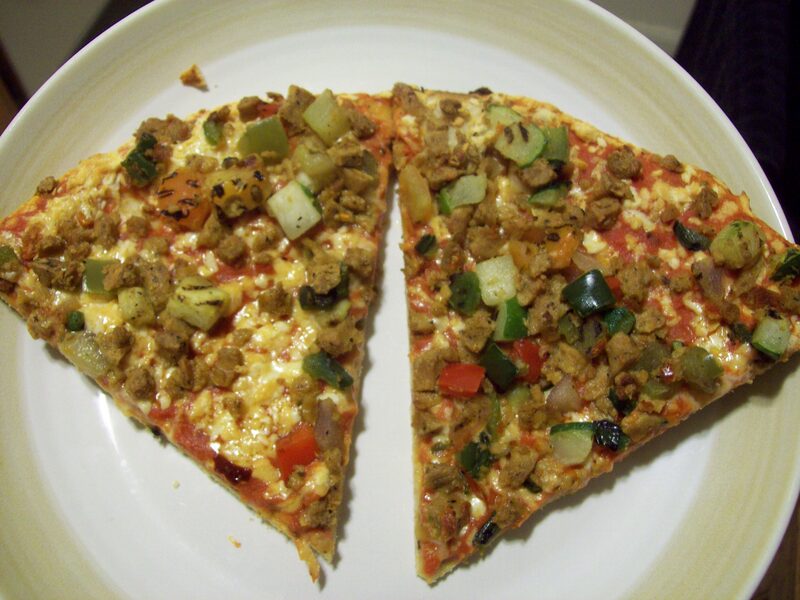 Short cooking time and easy to cut with my pizza cutter. Even though this pizza tasted decent, it probably still isn’t worth $7. There was not nearly enough Daiya cheese on this pizza. The Italian sausage was just okay, I expected it to be a bit more flavorful. I would probably buy this product again, perhaps another variety, if I need to get a vegan pizza to go and the store I am at is all out of Amy’s No Cheese Roasted Vegetable Pizza. The sauce they use on that pizza is so good, you don’t even need non-dairy cheese. I had the leftovers for lunch today and I have to stick by my “just okay” review. But I’m glad I finally tried it! 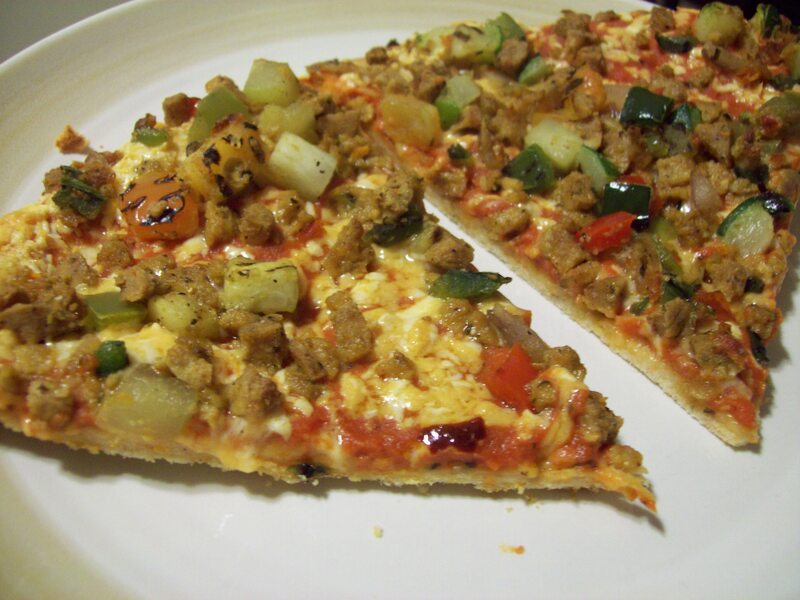 Have any of you tried the Tofurky pizza? Did you like it? I have not been blogging a whole lot the past few months and it’s had me doing a lot of thinking regarding this blog and it’s future. By the way, I’m happily taking suggestions on name changes. Ha. I feel like in many ways, I have moved away from what this blog was originally intended for (an accountability/food journal) and that’s okay. A lot has changed in the past two and a half years that I’ve been blogging here. But what hasn’t changed is that I still love to write and share the things I enjoy with people, which is what I want to continue to do here. I love this community! While my weight loss is a big part of my “story” and a reason for blogging, I don’t want to focus on that so much anymore. I still struggle sometimes to maintain my weight but I’m in a good place now and have another system of accountability that is working well for me now. I also went vegan more than a year ago and so much about that has changed my life and my views on a lot of things regarding food, health and other topics. I believe now more than ever that my body goes through cycles, or seasons. It seems like the same things happen at the same time every year. It’s so weird! But also pretty cool, since I have the old blog posts to prove it. On Monday, May 24th, I decided to try giving up caffeine again. I like the idea of having one cup a day but since we all know that I’m not good at moderation, one cup became a few. And sometimes I’d throw in the occasional venti iced coffee from Starbucks (oops). One night last week, I was up way past my bedtime and most nights I don’t sleep well. So I figured giving up caffeine was a good place to start. The funny thing is I made this same decision on May 19, 2009. And on April 1, 2008 (on my old Xanga blog, pre-See Sarah Eat days). That’s just one…there are others! I recently decided to stop calorie counting (4/8) since it wasn’t doing me much good. I made this same decision on May 4, 2009. I recently did a post on the value of meal planning. I made this a challenge on May 26, 2009. 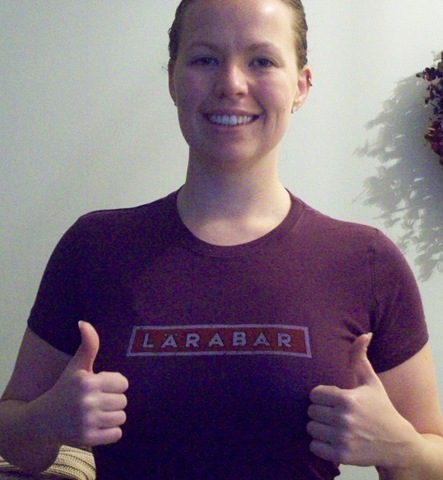 I totally worked out in this shirt yesterday. A year ago today, on May 26, 2009, I decided to stop weighing myself. Just as I did on July 23, 2008. Not weighing anymore is an idea I have been toying with again for some time now. But I don’t think I’m ready for that, at least not until the end of the Pound for Pound Challenge. Which hasn’t been going so well, but oh well. I just think it is interesting how every Spring, I get tired of calorie counting (and weighing myself), suffer from allergies, stop eating meat (well that was a given this time), and have a desire to give up caffeine. It is so funny how our bodies operate. Now, my goal is to not repeat the July weight gain of 2008 and 2009. I’m already a little above my “happy zone” so I need to be careful. I’m interested to look back through the blog and see what it is exactly that makes this happen and how I can keep myself from repeating at least one thing this year! I just thought I would take this opportunity to talk about some changes I have decided to make on this here blog. 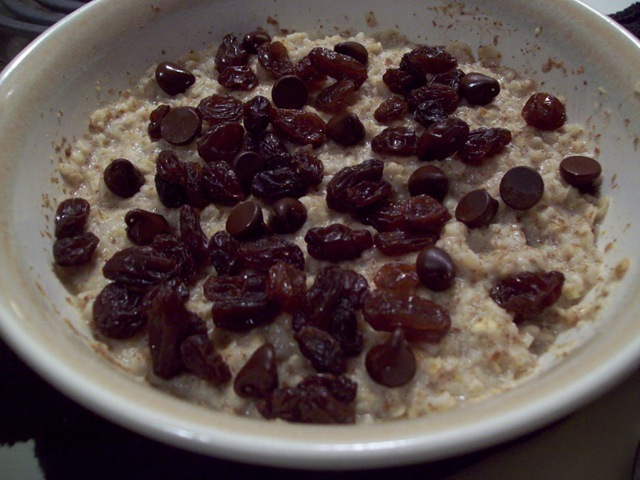 As my long-time readers know, I have always gone back and forth on the “daily eats” postings. It’s a very love-hate relationship. Sometimes I love to do it and sometimes it’s a downright chore. Forced. Artificial. I want to be writing posts more for quality not quantity. I want to give you my best! I blog because I love to write and I’m a foodie at heart, not because I need to keep up with the Joneses or get a certain number of page hits to make money. That’s just not me. This is my hobby, my creative outlet, not my job. But it still means a great deal to me and I am so thankful for the priceless support that I receive because of this blog. I may still do the “what I ate today” posts from time to time but it won’t be the norm. In fact, I have enjoyed blogging so much more this past week or so, doing posts about recent restaurant visits, new product finds, favorite topics, and a few other things I am currently enjoying in life. Writing about these things feels more real to me and therefore that is what I must do. I still plan to post daily and on occasion more than once a day if there’s a lot of excitement going on. I have a lot to share with you guys over the next few days so come back later. And thank you very much for your readership. Hey guys. I’m feeling really overwhelmed. I need a break. Blogging is so much fun but when life gets stressful, it is just one more thing on the to do list. I don’t want it to be that way, so I’m stepping back for a little while. Not long though. Just enough time to clear my head and get refocused on my goals and what makes me happy and getting control of what doesn’t. I’m running a half marathon this weekend (hope to do a recap over at River City Fitness) and I need to mentally prepare for that. I’m also getting ready to finish up school for this semester. And just a lot of other stuff going on that I won’t dwell on here. Anyway, I love you guys and thanks for always supporting me. I will be back soon! So after reading through your comments and giving it some serious thought, I know that I definitely still want a whole day’s eats as part of my blog. Just not every single day. My food tends to get repetitive, especially when I make a recipe that only I will eat and I repeat a meal several times over the course of a week! So I plan to do a full day of eats, drinks and everything one time a week…on Mondays! The rest of the days of the week will be focused on other things like recipes, products, weight loss challenges, thoughts, etc. This way I can keep posting on the blog daily but not get overwhelmed or think it’s too boring. 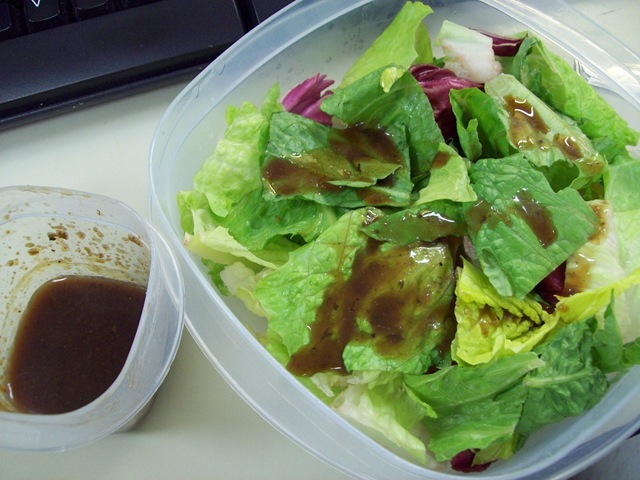 Somehow I managed to leave my morning snack at home, so I had to break into part of my lunch early, which worked fine. 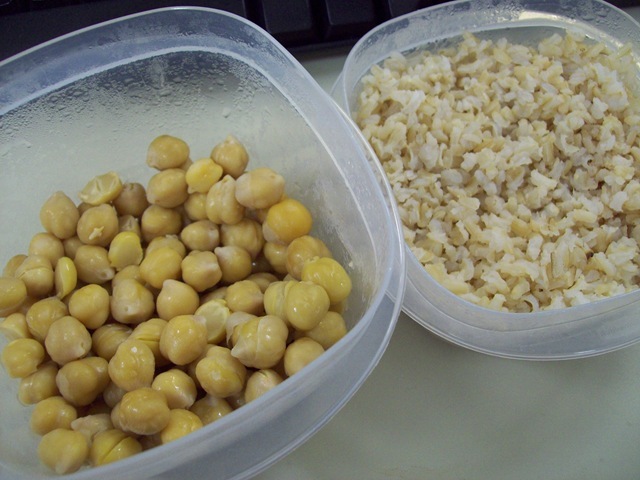 Then an hour or so later, I ate the rest of it which was leftover chickpeas and brown rice. 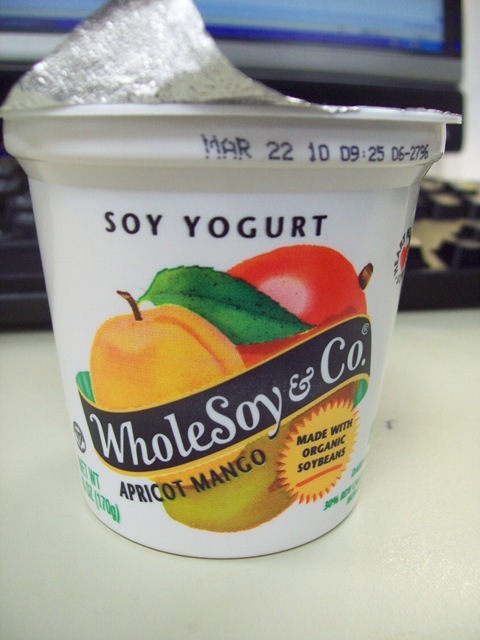 For my afternoon snack, I got to try a new flavor of Whole Soy & Co – apricot mango! This was tasty and even though I’m not a huge fan of the 18g of sugar, that is lower than a lot of other soy yogurts on the market. I just try to only have them once in a while. After my snack, I went to a yoga class before heading home. 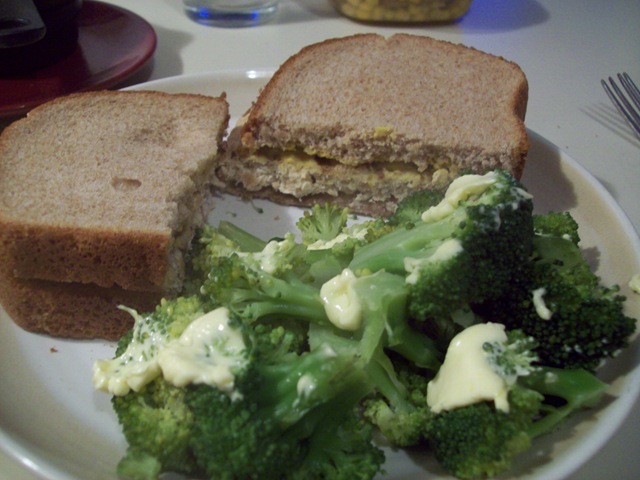 For dinner, I made another Morningstar Farms Grilled Chik’n patty on whole wheat bread with mustard and a side of broccoli with Smart Balance Light. I think I will use my last one in spaghetti sauce again, they don’t have a whole lot of flavor on their own, but this dinner filled me up just fine. After dinner settled, I headed to the gym and ran a few miles on the treadmill. 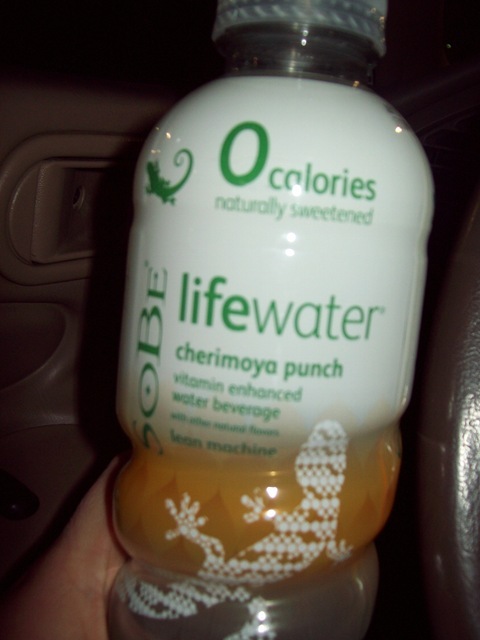 I rehydrated with this! Told ya, it’s becoming a habit. I love these things. But does anyone know of any “natural” fitness drinks? I’d hate to keep spending $1 a pop since that is one of the reasons I gave up bars for Lent! 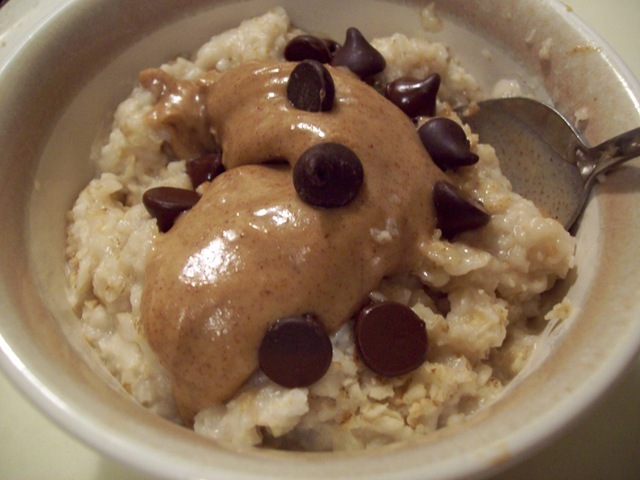 When I got home from the gym, I had a small serving of oats with almond butter and chocolate chips. My best friend Courtney recently started a new blog and I hope she doesn’t mind me mentioning it here. But it has really inspired me. It’s called “Even if it doesn’t pay…” and she discusses a lot of things going on in her life but mostly how all of this has inspired her to start writing again…even if it doesn’t pay. She’s very talented! It got me thinking about my own blogging and how I have days where I think absolutely no one cares about or reads my blogs. I even feel silly sometimes putting all this out there. But I know that’s not true. Sometimes it’s hard though, to see how well others blogs are doing and how even though I have been blogging for almost 2 years now, mine just hasn’t taken off the way I’d hoped it would. But this brought me back down to Earth. Numbers of page hits, readers, and stats are not why I blog. I blog because I love it! I blog about food because I love to cook and eat, especially now that I have a healthy relationship with food again. Especially now that I’m vegan! I love to blog about exercise because I love it! I love to run, I love to sweat, and I love the Zen that comes from practicing yoga. I love the way my body, mind and spirit feel because of the way I live now. And I love all of you who stop by, leave me sweet comments, and make me feel like what I do matters to someone other than myself. So, in the spirit of my dear friend, I’m going to keep it up, with a positive focus, and have fun. Even if no one reads it. THIS IS MY 1,000TH POST!! I can’t believe I have been blogging long enough for there to be 1,000 posts on my blog! I have started another blog! After lots of thinking and inspiration from a friend, I have decided that I want to separately blog about food and fitness. 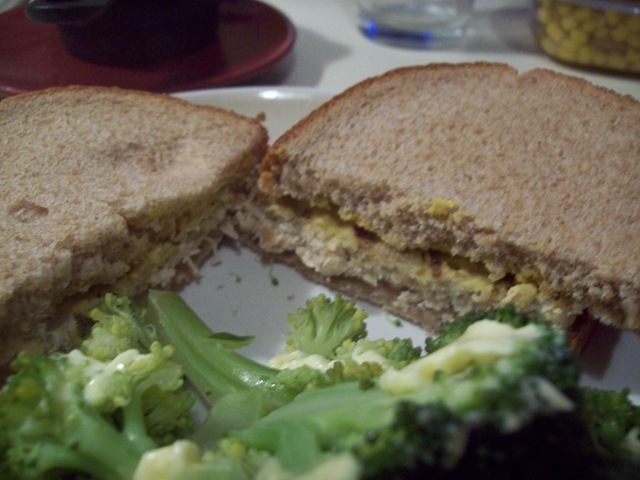 For See Sarah Eat, this means more posts about meals, recipes and new product finds. Finally, clear things to focus on! My other blog, River City Fitness, will be all about my exercise program, including my running, yoga, and whatever else I get myself into. I’m sure this will expand as the blog develops.